The annual Global Iron Ore and Steel Conference is recognised as THE conference to keep yourself up to speed on the global outlook for iron ore and steel demand / supply balance, where industry leaders comment on their future plans, opportunities, challenges, threats and release new announcements that can shift the balance of the market. With so much uncertainty and competing views, it's important that you arm yourself with the latest expert analysis. Take this opportunity to question the people in the know firsthand. If there ever was a time you needed the latest views on the future of the market and industry then it is now, and this conference will provide it to you. IMM Events are pleased to announce the dates for our 4th annual Africa Iron Ore conference that will be held on the 3rd and 4th June 2014 at the Radisson Blu in Johannesburg. Africa Iron Ore complements our successful iron ore portfolio which includes the Global Iron Ore & Steel event in Perth, the EU Iron Ore event in Berlin, London, Stockholm and Paris, and the Americas Iron Ore event in Rio de Janeiro and Belo Horizonte. The African iron ore market has seen an increasing interest in the past few years with several international mining companies and juniors actively exploring in the African continent’s untapped sources of iron ore; new deposits have been discovered and new production shipped to supply the demand coming from fast-growing economies. Africa’s role in the future of the global iron ore industry is becoming a reality, however not without challenges that the 4th Africa Iron Ore conference will discuss and address. This year’s event follows the success of our previous conferences that are quickly becoming the regular annual gathering for iron ore and stainless steel executives engaged in the African Region. WELCOME TO EURO MINE EXPO 2014! Euro Mine Expo will again be arranged at the very heart of Sweden’s mining industry. In this region, tradition and history go hand in hand with technical development and innovative ideas, all of which you will be able to see for yourself if you take part in some of the planned field trips. Welcome to Sweden, to Skellefteå and to a glimpse of the future of our industry! CIME is an international brand mining trade show, which has gained high praise and unanimously approval from enterprises and agents both home and overseas for many years. Through nine years of innovation and development, the influence of CIME keeps increasing in the global mining industry. On the basis of previous year’s successful organization of CIME, CIME2014 continues to insist on professional and normalized market operation and adheres to service concept of ‘efficient and considerate’. It will base on the development trend of mining industry and new trends of the China economy and policy, dedicating to building high-end cooperation platform for the global mining industry. To constantly enrich and improve the quality of CIME2014, the organizer will hold multi-level activities such as International Mining Investment & Financing Cooperation Forum, China Mineral Resources Comprehensive Utilization Development Forum, etc. Getting together advanced ideas, technologies and products of mining fields and sharing the dynamic, hot topics and news of the forefront of the mining industry, CIME2014 is expecting to meet you in Beijing to explore new developing opportunities in the mining industry. Organiser: Shanghai SteelHome Information Technology Co.,Ltd. SteelHome, which provides comprehensive information, consultancy, database, industry events and E-commerce to steel industry chain, is authoritative leading independent website in Chinese steel market. With solid relationship with steel companies, raw material suppliers, traders, logistics companies and steel users, The Steel Development Strategy Conference becomes the best networking opportunity with Chinese steel companies, as every April of over 800 delegates from Chinese steel and raw materials sectors who gather in Shanghai discussing the market and network for a better cooperation, around 150 are Chinese steel companies. The chance to promote brand loyalty via technology displays, hospitality and networking events. The chance to overcome objections to purchasing decisions. Supply of plant, machinery, process control equipment, projects and services etc. In the past year, the iron ore industry has seen a very high level of uncertainty and volatility with prices fluctuating from a low US$99 a tonne in September 2012 to US$155 in February, an unbalanced steel demand across Europe, and some mine expansions put on hold, creating an even more difficult market to analyse. India is endowed with large mineral resources, especially of iron ore, bauxite, coal, base metals, noble metals and diamonds. However, most of these resources are either under–explored or under – exploited or both, for a variety of reasons. For achieving a high manufacturing growth rate as envisaged in the New Manufacturing Policy and also the emphasis of infrastructure during the 12th plan (1 trillion dollar), the mining sector has to grow faster, and has to make higher contribution to GDP. To achieve these ambitious objectives, entire value chain of the mineral sector starting from reconnaissance, exploration, mining and beneficiation and downstream sectors have been streamlined so as to attract investments from both domestic as well as international investors, particularly in exploration of strategic and deep – seated minerals requiring state-of-the-art technologies and risk capital. Regulatory mechanism is being streamlined to facilitate such investments and accelerated implementation. All these developments need to happen in a Sustainable Development Framework so as to ensure inclusive growth. In order to attract investment and technology FIMI is organizing a three-days Convention on “Mining, Exploration Convention & Trade Show from 19-21 September, 2013 at Bangalore International Exhibition Centre (BIEC), Bangalore with the support of PDAC to provides a unique opportunity for various stakeholders involved in the mining value chain – policy makers, exploration agencies, mining companies, regulatory agencies, technologists, economists, investors including people from abroad – for intense deliberations and discussions. The Ministry of Mines has sponsored this event. The Southern Africa Mining Summit 2013 (5th & 6th of September) taking place at the Lagoon Beach Hotel in Cape Town. The Summit consists of a two-day conference, exhibition and networking event and will be exploring the latest developments, strategies and opportunities within Southern Africa’s mining industry. Bringing together professionals from across the industry, the purpose of the event is to facilitate the growth and development of Southern Africa’s mining sector. Hosted by the Ministry of Land Resources, Tianjin Municipal Government and China Mining Association, the 15th CHINA MINING Conference and Exhibition 2013 will be held at the Tianjin Meijiang Convention and Exhibition Center on November 2-5, 2013. MINING plays a critical role in creating more communication and co-operation opportunities for domestic and international industry communities. Since the first time CHINA MINING was held in 1999, the scope and influence has been extending every year. CHINA MINING Conference and Exhibition has now become an annual not-to-miss event and a platform for the world mining players. Last year's event has concluded with great success - 429 exhibitors and 6000 delegates from 57 countries joined CHINA MINING 2012. CHINA MINING Conference and Exhibition consists of three parts - Conference, Exhibition and Coherent Events. Following on from the success of last year’s inaugural event, the Metal Bulletin African Iron Ore Conference provides a forum for all key players in the world of African Iron Ore to convene in one room. Meet producers, government officials, steel producers and commodity investors to learn about opportunities and products coming out of the region, and gain knowledge into strategies that will help navigate the unique challenges of iron ore mining in Africa. ● Receive vital information from financial experts on how African mining projects are viewed and which projects are most likely to gain investment. The Americas Iron Ore Conference is one of the most respected annual gatherings for North and South American iron ore markets and its agenda features: iron ore industry and market developments; new project developments and expansions in North and South America; overview of steel demand; iron ore spot market price; infrastructure and transport challenges and investment opportunities. After five successful editions, the Americas Iron Ore Conference consolidates as the largest meeting place for executives and professionals of the steel and iron ore industry in the region. Tayfun Eldem, P.Eng., President and Chief Executive Officer, Alderon Iron Ore Corp.
As the price of Iron ore reaches further lows, the industry faces uncertain times. What will the current market ramifications have on production? How will China attempt to restimulate growth? Are we at the end of a super cycle? Ore 2013 will address these major questions facing professionals in the industry. With over 400 attendees in 2012 and many more expected this year, the China Iron Ore conference is the must attend event for all professionals in the Asian iron ore market. · Gain a comprehensive overview of the market throughout the whole value chain. 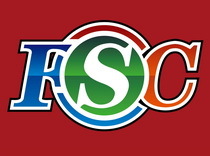 · Meet new clients at the biggest event of its kind in China. With over 600 delegates expected, this is the largest gathering of ferro-alloy professionals in Asia and is the ideal opportunity to meet you suppliers and customers. In addition, senior executives from Sinosteel Jilin Ferroalloys Co. Ltd., McKinsey & Company, Jinguang Group, Dunfeng Holdings Inc., Shanghai Tsingshan Mineral Co., Ltd, CLSA, Minmetals, OM Holding, National Association of EMM Plants Directors (Managers), National Association of Manganese Mines Directors (Managers) and many more will be discussing important industry topics including pricing, the market overview, the future of the industry and related metals in ferro-alloy production such as silicon, chrome, manganese, tungsten, vanadium, molybdenum and nickel. The Australian Journal of Mining is pleased to announce the dates for its 16th annual Global Iron Ore & Steel Forecast Conference: it will be held on 19 & 20 March 2013 at the Pan Pacific Perth. The 2012 event registered a record number of delegates, confirming its role as Australia's premier event for the regions iron ore and steel industry. Two optional pre-event workshops will take place on Monday 18th March. Damian Connelly, Director Principal Consulting Engineer, Mineral Engineering Technical Services, METS, will run Workshop A: Challenges with beneficiation of iron ores. In the afternoon, Workshop B will be run by Francis Browne, Editorial Director, Price Group, Platts, this will cover Commodity price benchmarking. The thousands of industry players who attended the AJM conference during the past 15 years, recognise this as THE conference that delivers the vital information on the status of the global iron ore and steel sectors; where industry leaders comment on their future plans and release new announcements that can shift the balance of the market; and that gives the opportunity to network and do business with key clients and make new contacts. The agenda will be constantly updated and delegates can register online or call 02 9080 4307. 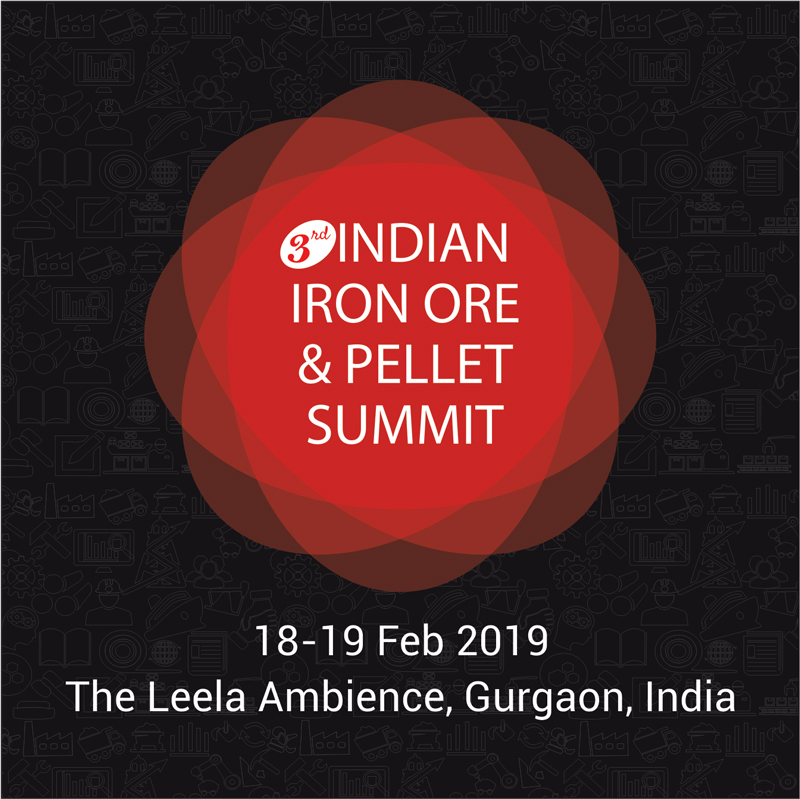 The current transitional phase of Indian iron ore industry along with the increasing demand and upcoming iron blocks auction, will change the rules of the game. In FY20, India’s annual iron ore imports is likely to remain around 10-15 MnT which might make India a net importer of iron ore.
Indian pellet exports increased multi-fold to 9.6 MnT in CY17 amid Chinese policies and absence of supplies from Samarco. 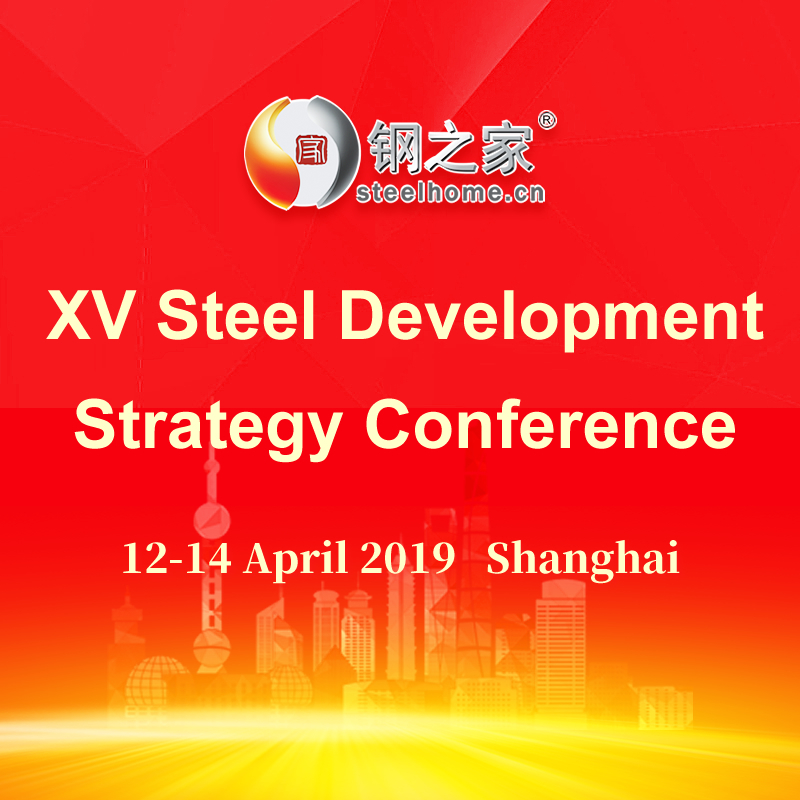 XV Steel Development Strategy Conference will be held in International Convention Center, Shanghai, China during 12-14 April 2019. Around 1000 delegates from governments, associations, 150+ steel mills, miners, traders, research institutes, media, as well as overseas delegates from 20+ countries will attend the conference. The conference will concentrate on a series of hot issues in terms of the development trend and challenges of the steel, iron ore, coal and coke market. Welcome to attend XV Steel Development Strategy Conference and focus on insightful perspectives from industry experts, and meet 1000+ Chinese steel insiders.